We are a technology based company specialize in telecommunication product development and distribution. Our company comprises of staffs with 10 years of telecommunication experience. We have footprints in sector such as PABX, IPPBX, Headsets, Call loggers, Call centers and Hospitality. Our 250 sales channels range throughout Malaysia. Which includes many IPPBX solution providers, PABX dealers/distributor, Solution integrators. We have in-house developed IPPBX products, Call Logger and SIP Gateway. We have in house IP Phones, Door Phones and Hotel phones. For Malaysia market we provide rental / leasing scheme as well but we mainly focusing channel based distribution. 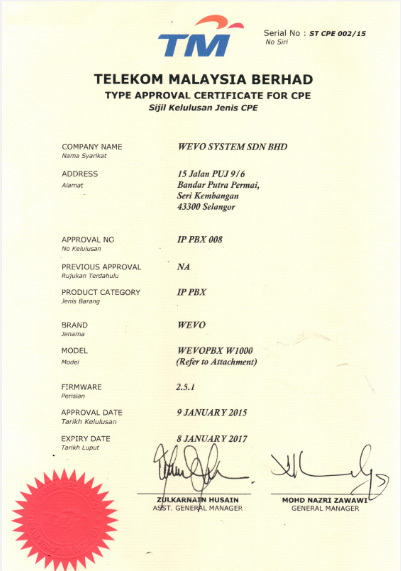 Product IP owned by Wevo, fully made in Malaysia. Hardware: Softswitch IPPBX for 80~5000 Users, Call Logger, SIP/PRI GW. Software: Call Center Apps, CRM, Call billing, Hotel SW.
Certified to be use with TM MLS SIP. © 2019 WEVO. All Rights Reserved.